Google claims new Nexus 7 delivers 30% wider range of colors – what do they mean? It depends on their frame of reference- what color space they are using and what color gamut standard they are comparing against. Since Google talked about the accuracy of HD video at their event, let’s assume that they are referring to the HDTV broadcast standard (rec.709) and using the common CIE 1976 (u’ v’) color space. 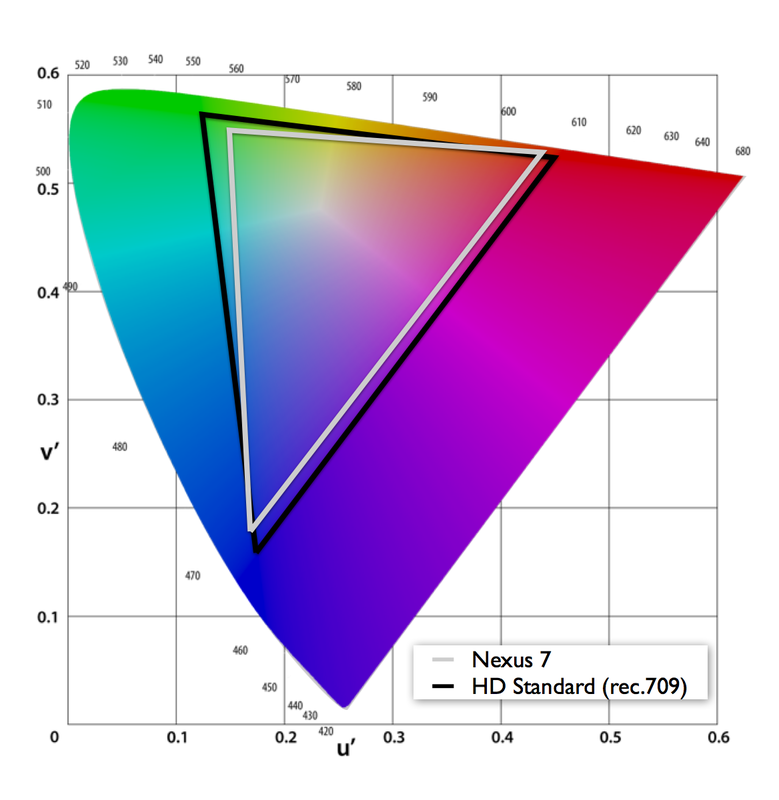 Color gamut of Google’s previous generation Nexus 7 versus the HDTV broadcast standard (rec.709). Plotted in CIE 1976 (u’ v’). With just a simple calculation, increasing 82% by 30%, you’d get about 106% coverage of the HDTV broadcast standard. 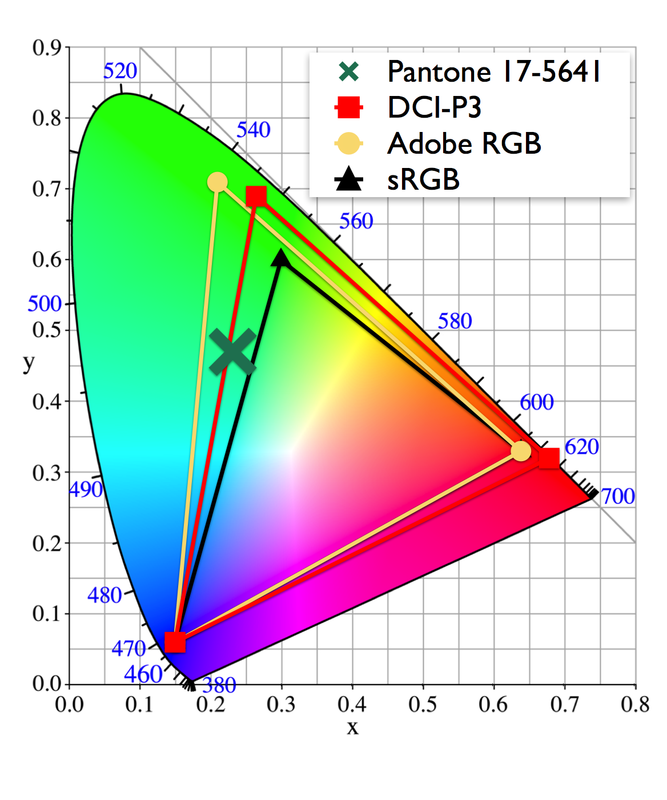 While that’s actually a slightly wider color gamut than the standard, it is not uncommon for device makers to use a wider color gamut in order to guarantee the color spec across all devices with some room for manufacturing tolerances. This means video and web content should be displayed accurately and it could make for a great looking display. * note: I always measure coverage of broadcast standards, not simply total area since that can be misleading. However, in this case, coverage and area are nearly the same since the Nexus 7’s gamut is smaller than rec.709. Content is king. One of the biggest challenges for emerging display technology is content availability. Whether it’s 3D, 4K or wide color gamut, these new features simply aren’t worth much without access lots of great, optimized content. As new 4K TV’s begin hitting store shelves this year, they are entering a content vacuum. Standards bodies like the Consumer Electronics Association (CEA) and International Telecommunication Union (ITU) are still working out the precise definition of marketing terms like Ultra High Definition TV (UHDTV). Proposed standards could include support for eight million pixel resolution, extremely wide color gamut and 3D content. But, today, there is almost no content out there that takes full advantage of all of the exciting capabilities of the new sets. And, unlike the transition to HDTV, there’s no government-mandated switch on the horizon to force broadcasters to get on board. At least one set-maker is taking it upon themselves to solve this problem by delivering both the 4K content and hardware. Sony announced last week that it will loan a 4K Ultra HD video player loaded with UHD content to buyers of their new 84” UHD television. The selection of 4K content on this player is fairly limited for now, but as more titles are released, this approach could help drive adoption of high resolution and wide color gamut formats. I wouldn’t be surprised if other set makers started following suit, though Sony does have an inherent advantage, owning a movie studio. 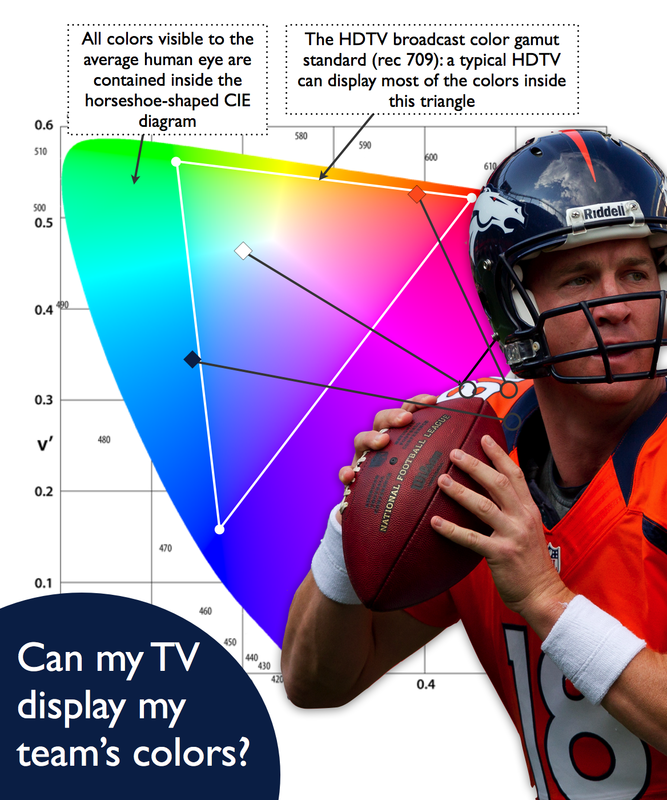 Can your TV accurately display your favorite NFL team’s colors? Could it be that something as simple as an NFL jersey is not within the color gamut of modern HDTVs? 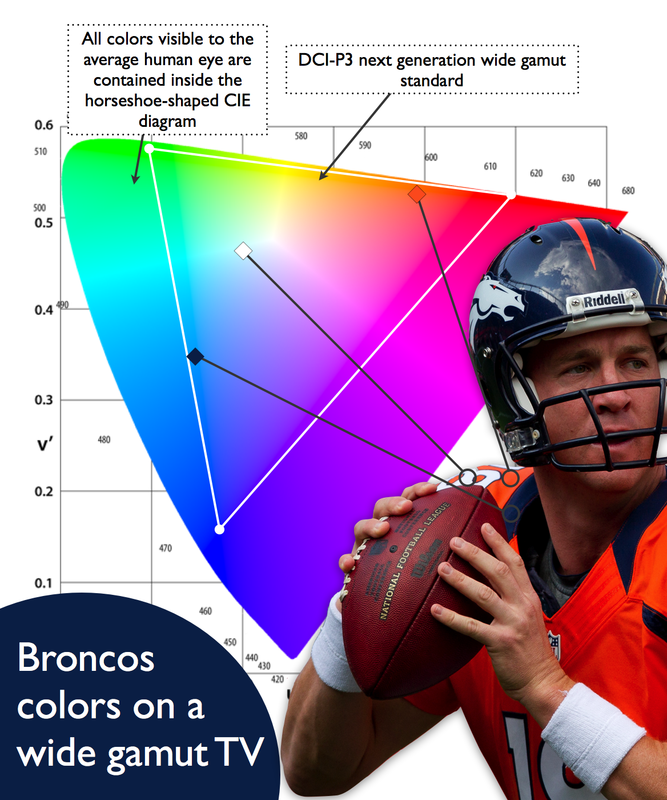 I mapped the Broncos team colors onto the CIE 1976 color space along with the HDTV color gamut standard, called rec.709. As you can see, the orange is right on the edge and the blue is indeed outside the gamut. When we think of high color content, we think of action movies and video games, but this exemplifies how color performance affects everything we see on our TVs, even down to the jersey being worn by our favorite sports team. Luckily high color displays are on their way to fix this problem. As you can see, the Bronco’s colors fall nicely within the much wider DCI-P3 color gamut.